That photo shows about half of the property. The line where the hay bales end is the road and beyond that is another property that was eventually built upon. My parents designed the house to take in every advantage of the sun and the rain and even included a solar hot water system – possibly the first in the area. It took a little while to get going, especially on cold mornings, but it was pretty innovative at the time. 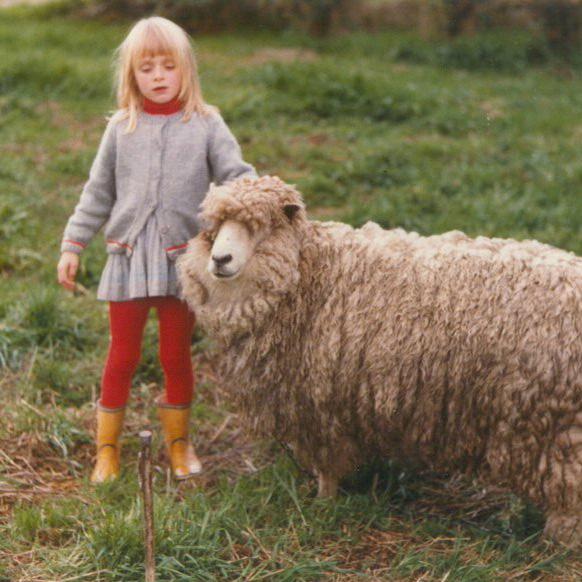 We mostly had sheep and hens, including one sheep that lived next to the house and kept the grass nice and short. He looks enormous in the photo below but it’s only because I’m so tiny. We used to try and ride him but he wasn’t really in to it. He didn’t throw us off or anything; he just tended to ignore us and stand there cropping a single clump of grass for the forseeable future. So it was more ‘sitting’ rather than ‘riding’ but it never stopped us trying. As a kid, I didn’t appreciate what a momentous move it actually was for my parents. 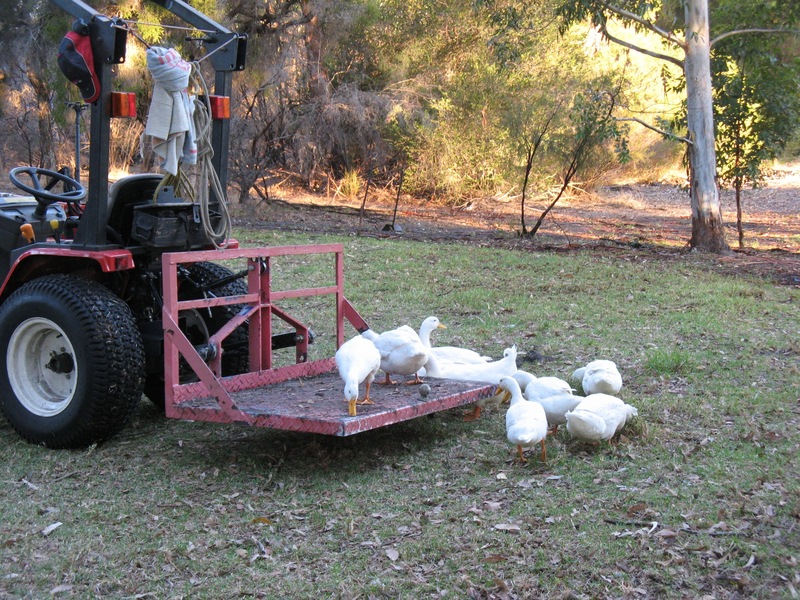 They were going from a suburban life and a suburban upbringing to a ten acre plot that they had to manage themselves. Imagine that! My brother and I just went with the flow, obviously, given that we were five and two at the time. An announcement that we were moving to the country was met with no more or less enthusiasm than an announcement that we were having ice cream for dessert. It just happened because our parents willed it so. 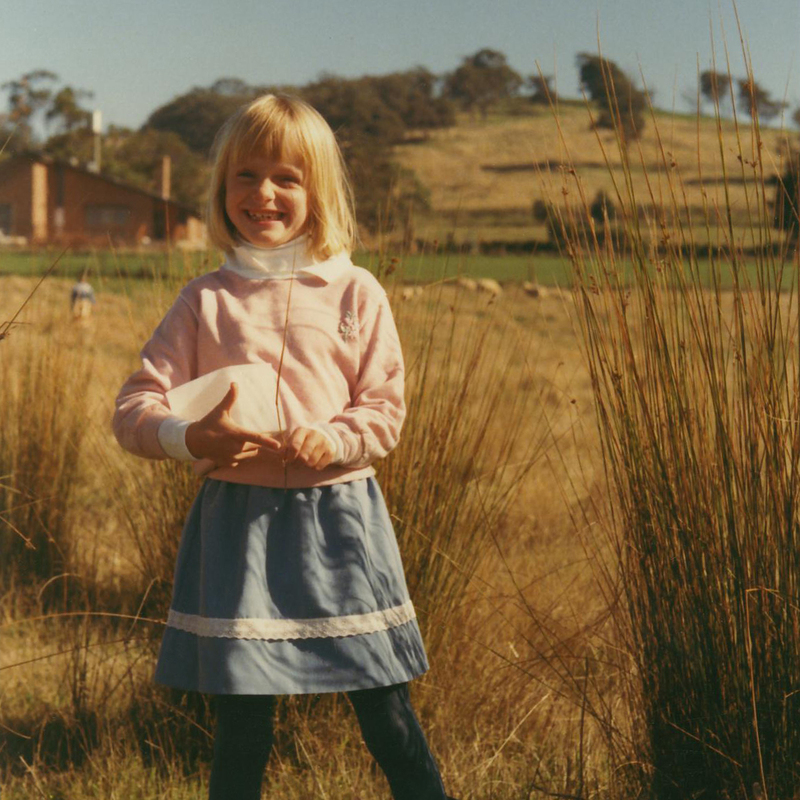 Apparently, my standard paddock attire was skirt and stockings (with unseen gumboots – trust me on this). This neatly aligns with my approach to dressing now, although without the gumboots. We had a couple of steers at one point that I think we eventually ate, although I may be imagining this. Our neighbours had cattle and I thought they looked like much more trouble than sheep. I still think this, whether I’m right or wrong. Plus, sheep have the odd tendency to jump over absolutely nothing because the sheep in front of them did it, which is kind of hilarious to watch. And I did watch it a lot because I was brilliant at herding sheep. It’s all about right angles. Fire optional, depending on seasonal need, of course. Eventually, we got a proper wood heater, but that Coonara did a pretty decent job of keeping the lounge room warm. Everywhere else was icy cold in Winter, but the lounge was fine. Look at that eighties style. I still remember those sunglasses – they were amazing! I felt so grown up when I wore them. Behind me, you can see two items that featured in our play: a big pile of dirt and a tractor. The big pile of dirt is that rather modest-looking green mound by my right arm. It ended up being much bigger than that and it was so much fun to play on. At one point, we made an elaborate little city of roads and pathways which was eventually worn away. The tractor to my left ended its life in stationary form, but it used to be put to good use. If we were lucky, we’d be allowed to stand on the carry-all (which looked a little like this) and be driven about the paddocks. It was bumpy and uncomfortable and you had to hold on for dear life. In other words: the best fun ever! 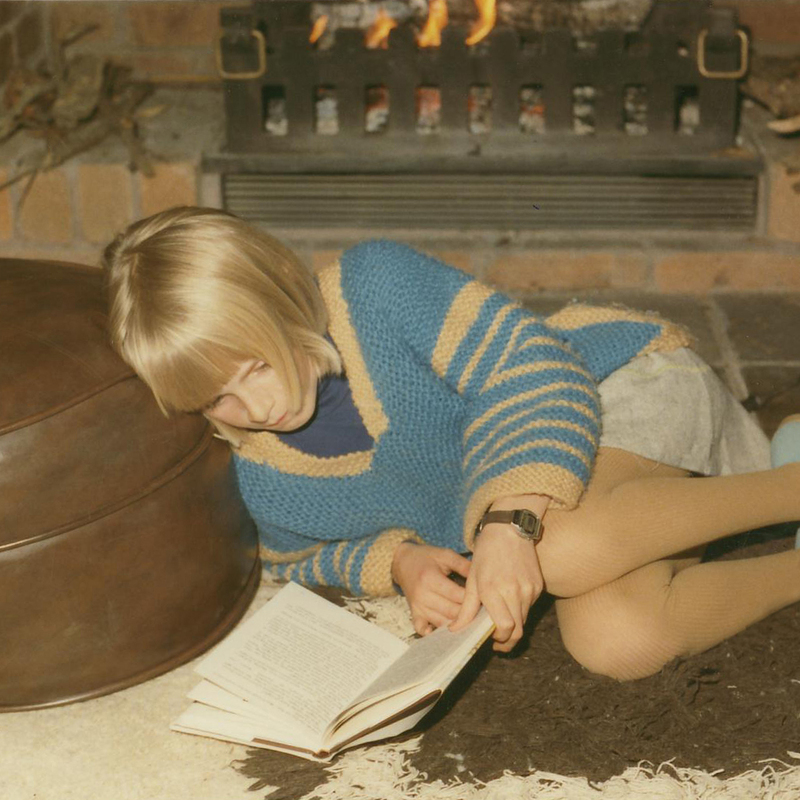 I always felt like a bit of an outsider at school – always the ‘new girl’, even though I’d been there since Grade 1 – but I’m glad I grew up on those ten acres in a great, wide valley. Fresh air, fresh food, pets to love and look after, eggs to collect and mountains to adore – childhood doesn’t get any better than that. Growing up, I never really thought about how my parents felt about this move they’d spear-headed and by reading Jo’s blog, I feel as though I’m finally having a glimpse into how it might have been for them. Obviously, our situations are somewhat different. Jo and her family live on a large, working farm far from town whereas ours was a ten acre farmlet within walking distance of town. (Assuming you consider a half an hour walk one way to be ‘walking distance’, that is.) But whenever Jo posts photos of whatever’s happening on the farm, I just think of the memories it will evoke for her kids when they’re grown up. They may be photos of completely ordinary things, as with the ones I’ve shared here, but I’m sure it will take them right back to the moment as these ones do for me. Really enjoyed reading this. And wonderful warm photos. Have you asked your parents? Thank-you! I’ve never really talked about it with them because it was just something that happened, but I definitely have plans to change that now. I feel inspired now to ask my parents about their various moves! It was wonderful! I’m sure I didn’t appreciate it enough at the time, but I’m very glad of it now. Ten acres was enough for me – I can only imagine what it would have been like to grow up on a 3,000 acre farm! It certainly sounds as though it all worked out perfectly! I imagine the difference between home and where you took your children bushwalking would have been quite distinct, which gave them the chance to decide which they liked best. We always loved to visit our cousins, who lived in the inner Eastern suburbs, because it was such a different lifestyle (and it made me appreciate the country even more). My grandparents lived out in the country, and we visited them fairly regularly. There were lots of fields and woods to explore. In fact, it was there that my older sister first taught me the word “exploring.” I had a penchant for communicating with roosters and cows, plus I was wildly talented at accidentally finding and stepping in cow pies. You have just pointed out another advantage of sheep: no ‘pies’. Even with those slight down sides, I think every kid should have a country relative that they can visit – there’s no substitute for getting away from the suburbs and experiencing a different way of living. Oh bless, Katie! I remember a similar upbringing, though there was no livestock, just potatoes. And it wasn’t my parents’ land, they just rented the farmhouse on the hundreds of acres. 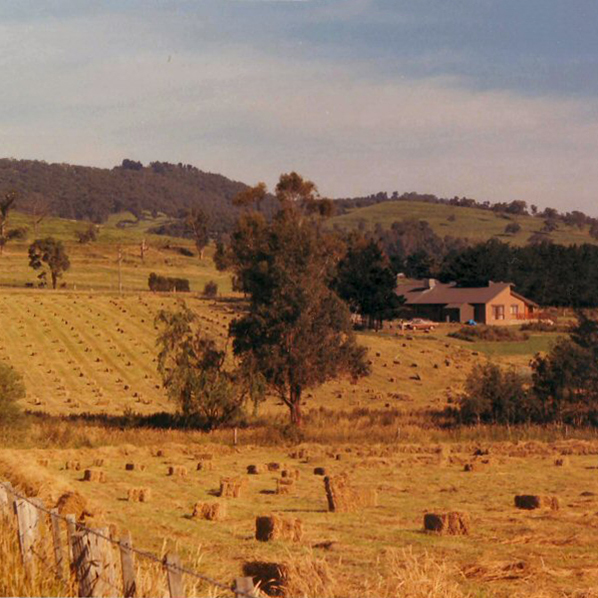 Even when we moved from the farm, we moved to a house further into town that backed onto a 10 acre or so paddock. Our house had no fences, so we had direct access to the spud paddock again. It was wonderful. Now my parents have a modest quarter acre (roughly) block (that is very much theirs, they just recently paid it off!) that I would love to have so I could have chickens and grow my own fruit and vegetables. I just don’t know that I could ever live where they do now as there are neighbours on every boundary. Thank you for the lovely burst of nostalgia and the fantastic shots you share with us. You are just as gorgeous now as you were back then. I grew up in a town, very far from country life as my parents had zilch interest in farming, well other than growing veggies in the backyard, that is. Suddenly, I decided to give the country living ago, mainly because it is hard to lodge horses in the town, as opposed to old days, people seem to object sharing their whereabouts with fourlegged, furry animals that weighs about 350 kgs…weird. Anyway, I faced a bit of culture shock here when I discovered that my skills and knowledge about farming was equal to zero and there’s a completely different way to do things here. 1/ You are in no hurry, things will be done in due time. There is no need to rush things. Where I come from, there’s no time like present, which still drives me nuts occasionally. 2/ The lack of Internet access and phone coverage is practically non-existant and you have to press your nose against the window while talking to people at the other end of the phone. Towns would certainly be a lot more interesting with horses all over the place! It would be like going back a century, when towns were full of horses as the major form of transport. There certainly are a lot of advantages to the country that compensate for some of the frustrating aspects. While there’s something to be said for getting away from the rush of always having to know everything right now, communication and contact with the outside world is still pretty important. Equally important is how it makes you feel, because then it becomes a balancing act where you work out if modern conveniences are more important than the feeling of escape. Gosh, what a neat story ~ I’ve always wondered what it would be like to live ‘on the land’ as it were. I think it really would be so different, but still so good. Thanks for sharing Katie. It probably was different but it definitely was good! I think the countryside seeps its way into your blood and is always calling you back. I’m glad you enjoyed reading about it. 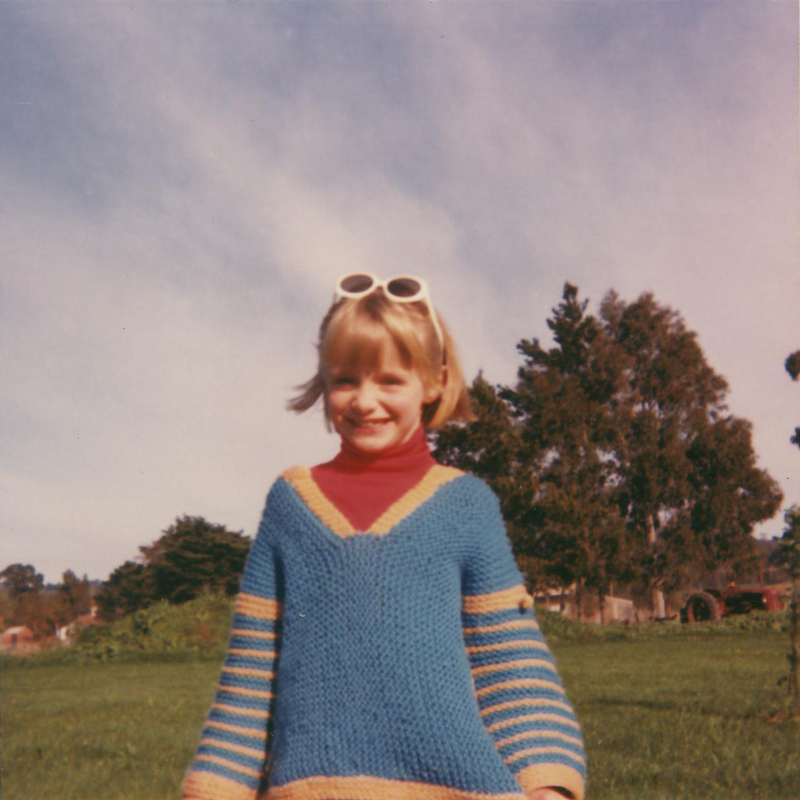 Lovely to read about your wonderful country childhood Katie (& cute pics too)! Every kid should have a big pile of dirt to play with! Thanks Katie, for your kind thoughts! 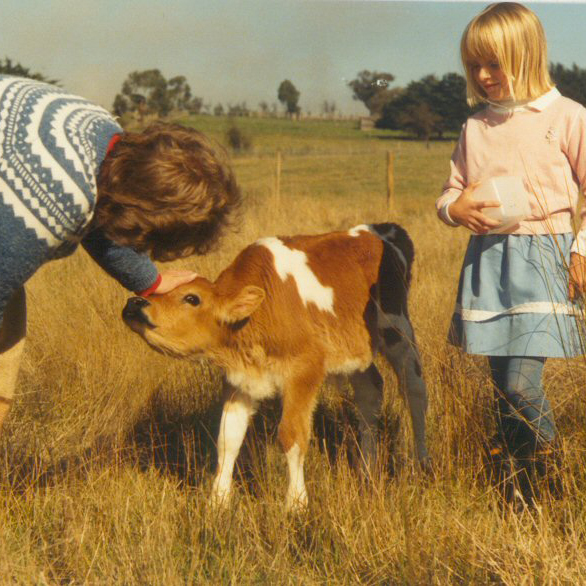 A country childhood is certainly something special, and I am so grateful for the opportunity to give it to our kids. Your childhood memories sound just like what my Country Boy talks about, and what I hope my kids will remember when they grow up! Thank-you for inspiring me to write about these memories in the first place! I really am enjoying the chance to see my experience from a different point of view.